NASHVILLE, Tenn. (October 17, 2017) – Mayor Megan Barry unveiled today Let’s Move Nashville: Metro’s Transportation Solution, a plan that aligns with the IMPROVE Act passed earlier this year. In early 2018, Metro Council members will be asked to put the plan on the ballot for the May 2018 countywide vote. Let’s Move Nashville is a $5.2 billion infrastructure investment that will be funded by a range of fees, including business, sales and tourism taxes. 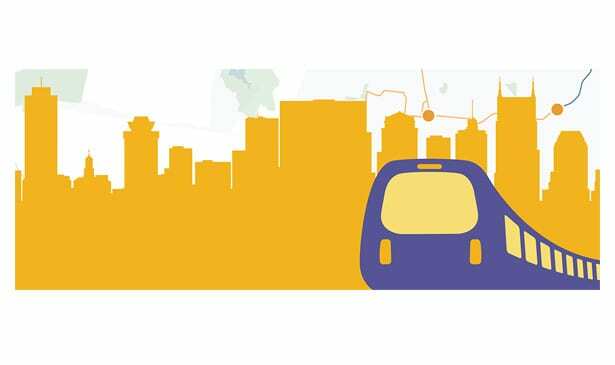 The plan originated after many years of study and community engagements through the nMotion strategic plan, which was led by MTA and RTA, as well as coordination at the state and local level. 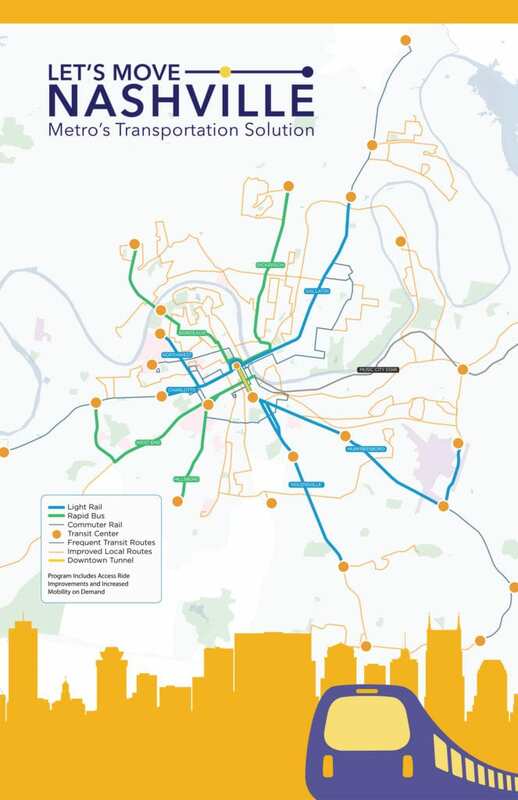 It includes 27 miles of Nashville’s first-ever light rail system, four rapid bus routes which will offer a dramatic increase on the service and frequency, and a strategy of service and infrastructure improvements. Existing bus service improvements with state-of-the-art electric buses and more cross-town routes, 15-minute peak service and buses running 20 hours of every day. Rapid Bus along Dickerson Road, Hillsboro Road, West End Avenue and the Bordeaux route, which will include signal prioritization, queue jumps, and infrastructure improvements to move transit riders faster to their destination. Light Rail on our busiest corridors – Gallatin Road, Nolensville Road, Charlotte Avenue and Murfreesboro Road to the airport. There will also be a light rail line using existing rails that will run along the Northwest Corridor to Buchanan Street near Tennessee State University. The network will begin operations in 2027 and be completed by 2032. Underground tunnel downtown serving the region’s job, economic and entertainment center while connecting the light rail network from north to south. Neighborhood Transit Centers that offer safe and comfortable access to the entire system. Transportation network enhancements such as better sidewalks, traffic synchronization and signal improvements, and fixing dangerous intersections. A recent study released by the Nashville Area Chamber of Commerce shows that nearly half (47%) of sales tax collections in Davidson County are generated by out-of-county residents. The Convention Center Authority, which is funded in part by local hotel taxes and fees, is anticipated to help pay for the transit system by constructing a SoBro station for light rail and rapid bus service. Additionally, the Metro Nashville Airport Authority has agreed in principle to fund a light rail spur from Murfreesboro Road to the Airport with terminal access. Metro currently charges a 1 percent tax on the gross proceeds derived from the lease or rental of any passenger motor vehicle, truck or trailer for a period of five days or less. This 20% surcharge would result in a total of 1.2% surcharge on rental cars. Businesses in Davidson County are assessed a business and excise tax based on a variety of classifications established under TCA 67-4-708. If a business currently pays $1,000 in such a tax, this surcharge would result in an additional $200 annually. Mayor Barry has also focused on equity and affordability as a component of Metro’s transportation solution. Under the proposal, fares for Nashville residents living at or below the federal poverty level will be eliminated, with additional reduced fares for young students, seniors, and disabled Nashvillians. In an effort to help further shape policies around affordable housing, including how best to use the transit-oriented development district legislation that allows Metro to capture and invest revenues along the transit corridors into affordable housing, Mayor Barry intends to create an affordability and transit task force in the coming weeks to address the needs of working families. Downtown Corridor: Nashville Farmers’ Market Food Court area – Thursday, October 26; 5:30 p.m. – 7:30 p.m.
Northwest Corridor: Tennessee State University, Elliott Hall – Thursday, November 2; 6:00 p.m. – 8:00 p.m.
Charlotte Avenue Corridor: Lentz Public Health Center, Centennial Rooms – Thursday, November 9; 6:00 p.m. – 8:00 p.m.
Murfreesboro Road Corridor: Trevecca, Tarter Student Activity Center – Tuesday, November 14; 6:00 p.m. – 8:00 p.m.
Nolensville Road Corridor: Coleman Park, Gym – Saturday, November 18; 12:00 p.m. – 2:00 p.m.
Gallatin Road Corridor: East Nashville Magnet High – Monday, November 20; 6:00 p.m. – 8:00 p.m.
Once the transit improvement plan is fully reviewed by the community and approved by an independent CPA firm with criteria set forth by the Tennessee State Comptroller’s Office, the Metro Council will be asked to consider an ordinance that will authorize the plan to be placed on the ballot for the May 1, 2018 election. For more information about the plan and upcoming Community Open Houses, please visit www.letsmovenashville.com. Next articleTrump Tried To Look Compassionate. Instead, He Looked Like A Jerk.